Northants Steelbacks completed an impressive week with an eight-wicket thumping of Yorkshire in a rain-affected clash at Headingley. Having beaten Derbyshire on Thursday and claimed a point from a game ended by the weather at Leicestershire on Friday, David Ripley’s men put Yorkshire to the sword. Put into bat under cloudy conditions after rain reduced the contest to 14 overs a side, a further rain delay knocked two more overs off their allocation and the hosts stumbled to 82 for seven with Jonny Bairstow top-scoring with 23 off 16 balls. It was a total that never troubled the Steelbacks, who reached their victory target with 26 balls remaining to inflict Yorkshire’s third successive defeat after Richard Levi took his tally for the T20 Blast to 183 runs in six matches. Levi survived being dropped by Gary Ballance down the ground on 26 to hammer 35 off 21 balls, including four fours and two sixes, to ensure the Steelbacks’ reply got off to a flying start. He fell lbw to off-spinner James Middlebrook, playing against his former county, but Ben Duckett secured victory by hitting an unbeaten 31 off only 13 balls, including three fours and two sixes, alongside Pakistan all-rounder Shahid Afridi, who hit his first ball for six. Afridi also claimed three for 15 from his three overs, ensuring a Yorkshire side including Australian internationals Aaron Finch and Glenn Maxwell and England trio Ballance, Bairstow and Tim Bresnan, were unable to set a more challenging total. Yorkshire never recovered from losing their top three inside the first five overs with Australian T20 captain Finch, playing his first match of the summer after recovering from a hamstring injury sustained during the IPL, clipping Ollie Stone’s slower ball to mid-wicket. Maxwell then stepped away and drove straight to cover, while captain Andrew Gale pulled to mid-on. Their innings was further disrupted by another rain delay, and when they returned the loss of Bairstow, caught in the deep after top-scoring with 23 off 16 balls, set off the loss of three wickets in as many balls. Afridi, also had Ballance caught in the deep with the first ball of the next ball and won an lbw against Jack Leaning with a quicker delivery. Tim Bresnan hit a quickfire 14 off nine balls to finish off the innings, but Yorkshire’s total never looked daunting and 29 dots balls told their own tale. Bresnan showed great enterprise by having Josh Cobb caught low at second slip off his first ball of the match in the second over, but it was a temporary success for Yorkshire, who have now lost five of their last six home T20 matches stretching back to last season. 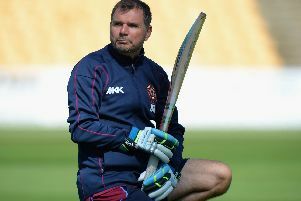 Steelbacks wicketkeeper-batsman Duckett said: “Richard Levi set the platform with one massive over for us. Yorkshire captain Andrew Gale said: “It was one of those things with Duckworth-Lewis getting involved. We wanted to be really positive coming out of the blocks but we know what Headingley’s like with a bit of cloud cover, and when it’s a bit damp and it seamed around.